Hemorrhagic ovarian cysts are benign adnexal lesions frequently seen in women of reproductive age group. They are formed as a result of hemorrhage into the corpus luteal/ follicular cysts. They are usually small in size and are known to resolve spontaneously. Infrequently, they may become large and undergo torsion and/ or rupture leading to life threatening consequences. 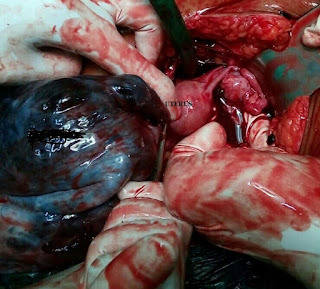 This report describes one such case where the patient presented with ovarian cyst torsion along with rupture, leading to massive hemoperitoneum and was managed successfully by prompt diagnosis and surgical intervention. Hemorrhagic ovarian cysts (HOCs) are a common finding in females of reproductive age group. They are formed as a result of hemorrhage into the follicular and/or corpus luteal cysts and may present with acute pelvic pain. Majority of them are small and can be managed conservatively. Only occasionally, they become large and undergo torsion and/ or rupture necessitating surgical management. Presented here is a case of a large hemorrhagic ovarian cyst with torsion and rupture leading to massive hemoperitoneum. A 39 year old female P5L4A1 presented to the emergency room on first day of menstrual cycle with sudden onset lower abdominal pain for 12 hours and five episodes of vomiting. There was no associated fever, bowel/ bladder complaints. She was a known case of bronchial asthma on treatment and had taken treatment for pulmonary tuberculosis 4 years ago. On examination, she was conscious and oriented. Her temperature was normal, pulse rate was 110/ minute, blood pressure 100/ 60 mm Hg and respiratory rate was 22/ minute. Pallor was present. On abdominal examination, there was distension, generalised tenderness and rigidity. A large solid-cystic mass corresponding to 20 weeks size uterus was felt arising from the pelvis. The finding was confirmed on per vaginal examination with the mass felt separate from uterus in the left fornix. Uterus was anteverted and of normal size. Urine pregnancy test was negative. Intravenous fluids were started, blood was sent for grouping and cross matching. Laboratory investigations revealed a low haemoglobin (7 gm%) with normal platelet count (2.4×106/cm3) and elevated white blood cell count (12,300/cm3). Coagulation screen was normal. An urgent transabdominal and transvaginal ultrasound revealed a complex left adnexal mass of size 12 x 10 cm, not separate from the left ovary with absence of blood flow on Doppler. There was moderate amount of free fluid in the abdomen with internal echoes. An ultrasound guided tap of the fluid revealed frank blood and she was shifted to operation theatre for an emergency laparotomy. Intraoperatively 1.5 litres of hemoperitoneum was drained. There was evidence of left sided 12 x 9 cms size hemorrhagic ovarian cyst with torsion (Figure 1). A small rent of size 3 x 4 cm, with an active bleeder was found on the posterosuperior aspect of the cyst. The external surface of the cyst was smooth without any excrescences. Left fallopian tube was adherent to the cyst and was elongated and gangrenous due to simultaneous torsion. Uterus with right sided fallopian tube and right ovary were normal. Cyst detorsion was not done. A left sided salpingoophorectomy was performed. She received 3 units of packed cell transfusion in the perioperative period. She had an uneventful recovery and was discharged on the 5th post-operative day. Final histopathological diagnosis was a hemorrhagic ovarian cyst but with no viable ovarian parenchyma. There were no features of malignancy. Figure1: Intraoperative photograph showing left sided large hemorrhagic ovarian cyst with normal right ovary and uterus. Hemorrhagic ovarian cysts occur as a result of bleeding into the functional follicular and/ or corpus luteal cysts. Hence, they are almost always found in the women of reproductive age group and are nearly always benign. They may also be found in postmenopausal women who are on cyclic hormone replacement therapy. These cysts are usually small with an average diameter of 3.5 cm (range- 2.5- 8.5cm). In our case, however, the cyst was unusually large with a diameter of 12 cm. Patients may be asymptomatic or may present with acute pelvic pain, more commonly in the luteal phase of the menstrual cycle. The pain is attributed to the sudden intra-cystic hemorrhage leading to cyst enlargement and peritoneal irritation. Cyst accidents such as torsion and rupture may also occur leading to signs and symptoms of acute abdomen, as was seen in our case. In such cases, other causes of acute abdomen such as ruptured ectopic pregnancy, endometriotic cyst rupture, pelvic inflammatory disease, acute appendicitis, mesenteric adenitis, Crohn’s disease etc need to be ruled out. Ultrasonography is the key imaging modality in the diagnosis of HOCs. The typical appearance is a thin walled cyst with smooth surface and an intra-cystic ‘Fishnet weave’ (reticular) pattern because of presence of interdigitating fibrin strands. A retracting blood clot within an anechoic cyst is also highly predictive of a HOC. Blood clots may mimic the solid component of an ovarian neoplasm, in which case a colour doppler ultrasonography should be advised. Absence of blood flow within the solid component suggests a blood clot rather than a neoplasm. Management of HOCs depends upon the clinical presentation, size of the cyst and ultrasound characteristics. Asymptomatic patients or those with mild symptoms, small cysts (usually <5 cm) and with a definitive ultrasound diagnosis, conservative treatment with analgesics, antibiotics and intravenous fluids is preferred. Spontaneous regression is known to occur within 2-6 weeks. Surgical management is indicated in symptomatic patients with larger cysts (> 5 cm), doubtful diagnosis and in those with signs/ symptoms of acute abdomen. In a study by Nair et al, conservative management of twisted HOCs in the form of detorsion and cystectomy was possible in 71.45% of patients. Most of them were young and in the early reproductive age group. Approximately 15% patients required a radical surgery, all of whom were postmenopausal, in view of hemorrhagic necrosis of the adnexa. Thus, in our patient, owing to the age of the patient, completed family status, massive hemoperitoneum with rupture of the cyst, hemodynamic instability and extensive hemorrhagic necrosis of the adnexa, radical surgery in the form of unilateral salpingoohorectomy was performed. Detorsion was not performed as it would not have changed the management in this particular patient. A laparoscopic approach could be considered where resources and expertise are available. Hemorrhagic ovarian cysts are a common finding in routine clinical settings and are usually functional cysts with negligible malignant potential. In majority of cases, ultrasonography establishes the diagnosis owing to their characteristic appearance. Choice of conservative versus surgical management depends upon the clinical presentation and the size of the lesion, and emergency surgery may be mandated in a few. Abbas AM, Amin MT, Tolba SM, Ali MK. Hemorrhagic ovarian cysts: Clinical and sonographic correlation with the management options. Middle East Fertil Soc J. 2016; 21(1): 41-5. Jain AK. Sonographic spectrum of hemorrhagic ovarian cysts. J Ultrasound Med. 2002; 21(8): 879-86. Nair S, Joy S, Nayar J. Five-year retrospective case series of adnexal torsion. J Clin Diagn Res. 2014;8(12): OC09-13.